On September 30th, New York Times reporter Simon Romero profiled the thief who had severed the bronze right foot from a statue of Don Juan de Oñate twenty years ago as a protest against the genocide of American Indians. Even the normally sedate “gray lady” could not help but refer to Oñate as the “despotic conquistador” of New Mexico. Indeed, the theft of the foot was highly symbolic since Oñate had once ordered the chopping off of the right foot of 24 Indigenous captives. Romero got a chance to interview the foot thief through a rendezvous set up by Cheyenne-Arapaho filmmaker Chris Eyre who made “Skins,” a 2002 film that climaxes with red paint tossed in George Washington’s face on Mount Rushmore. Trump is well-qualified to defend Washington and Jefferson since he harbors the same sort of racist attitudes that these Indian-killers embodied as early architects of Manifest Destiny. When he was building up his gambling casino empire in the early 90s, he claimed that Indian reservations were run by the Mafia. He secretly paid for more than $1 million in ads that depicted the St. Regis Mohawks in upstate New York as cocaine traffickers and career criminals around the time that they were seeking to build a casino in the county where I grew up. He even told the notoriously racist shock jock Don Imus that they were probably not real Indians, stating that he might have more Indian blood than them. Besides the St. Regis Mohawks, there was another Indigenous group seeking permission to build a casino–the Munsee Lenapes. They were ethnically cleansed from Sullivan County, where I grew up, in the 1800s. Monsey, New York (now a predominately orthodox Jewish enclave) was named after the people who lived in the area while the city of Muncie, Indiana was where they were forced to go. Frankly, I would welcome a return of all the Munsees to their original homeland. They certainly would have more respect for a beautiful part of New York state that is being sacrificed at the altar of capitalist development and its consequent environmental despoliation. When some on the left seek to contextualize Washington and Jefferson, it usually follows the line of reasoning that despite being slave-owners, they were also founding fathers of a democratic republic that was the envy of the world. While this might not sit well with the descendants of the slaves they owned, it also carries the burden of sweeping Indigenous peoples under the rug. 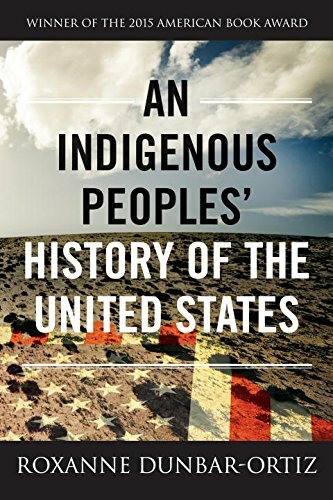 After reading Roxanne Dunbar-Ortiz’s An Indigenous Peoples’ History of the United States, you will conclude that all these great White leaders should be condemned to the ashbin of history. Published as part of the Beacon Press’s Revisioning American History series (there are also books about gays, the disabled and Blacks/Latinos in American history), it is very much in the vein of Howard Zinn’s “A People’s History of the United States”. While the term “revisionist” is often applied to works such as these, I am persuaded that “revisioning” is a far more appropriate term since it points to both past and future. If we do not have a vision of how the United States should be governed, our future is bleak. “Just a word about “universal fraternal union of peoples” and the drawing of “boundaries established by the sovereign will of the peoples themselves on the basis of their national characteristics”. The United States and Mexico are two republics, in both of which the people is sovereign. It makes for grim reading. M-E backed Kossuth and the Hungarian aristocracy in the 1848-49 revolt against the Hapsburgs and they hated the Croats and other minority ethnic groups for fighting on the Austrian side. But the Hungarian aristocracy was just brutal to its peasants. But at no point do they bother to discuss any of this. In short, they very much had a Hegelian notion of advanced versus backward societies of “cattle rustlers” if I remember one Engels’ jibe. Whether they fundamentally changed their views later in life is open to debate but (following in part Franklin Rosemont’s lead), Kevin Anderson forcefully argues for this point of view. I’d like to think he’s right. What makes Mexico especially egregious is that Engels made his living helping to run his family’s textile plant in Manchester, a plant dependent on Southern cotton. At one point in the early 1850s, Engels even planned a trip to (I think) New Orleans to visit the Southern cotton market, although the trip never came off. As far as I can tell, neither Marx nor Engels ever bothered to mention the extermination of the native peoples of North America although both became fascinated in the late 1870s by Morgan’s writings on the Iroquois from an anthropological point of view. Neither of them seems to have bothered to mention Frederick Douglass either although Douglass made extensive tours of Ireland and England before the Civil War to organize resistance against slavery. Also note not one mention of the extension of black chattel slavery (Texas was formed as a slave republic) in Engels’ remarks against Bakunin. Every once in a while I run into a book with such a combination of scholarship and Marxist insight that it really blows me away. It is a happy coincidence that the book I am reading now, Ephraim Nimni’s “Marxism and Nationalism”, dovetails perfectly with the cyberseminar. I owe thanks to Scott McLemee who tugged my lapel to this book. I am going to recapitulate material from the first three chapters of the book and conclude with some thoughts on what relevance it has for the ongoing discussion on nationalism. Such in Scotland are the Gaels, the supporters of the Stuarts from 1640 to 1745. Such in France are the Bretons, the supporters of the Bourbons from 1742 to 1800. Such in Spain are the Basques, the supporters of Don Carlos. I think that the break up of Yugoslavia was a mistake. Yougoslavia should have become part of the EU not Slovenia, Croatia and so on. I do not care to defend my position that Yugoslavia should not have broken up. If a person disagrees he or she is just labeling themselves as a person with poor artistic taste. The same position about a larger central government should apply to Spain and the UK. But these countries are not republics they are monarchies. Some would say that for all practical purposes Spain and the UK are republics because they are constitutional monarchies. Well were the political differences between Yugoslavia on one hand and the UK and Spain (or the republics of France and Italy) on the other great enough to say that these latter countries should be judged by a different standard than Yugoslavia? Are all positions on the subject of succesion just the subjective opinions of people with differing degrees of artistic talent?